The fat cat tumbled down the stairs, clawing the air, desperately trying to find its footing. The words you just read probably evoke some sort of emotional response. If you’ve ever seen something like this before, you can probably visualize it. As effective as language can be at conveying emotion however, video takes it to the next level. Our brains process visual information 60,000 times faster, and using sound and visual cues increases enjoyment and retention! Video puts us in the room where it happens, which makes it particularly effective in education as it creates context and puts learners at the center of the action. 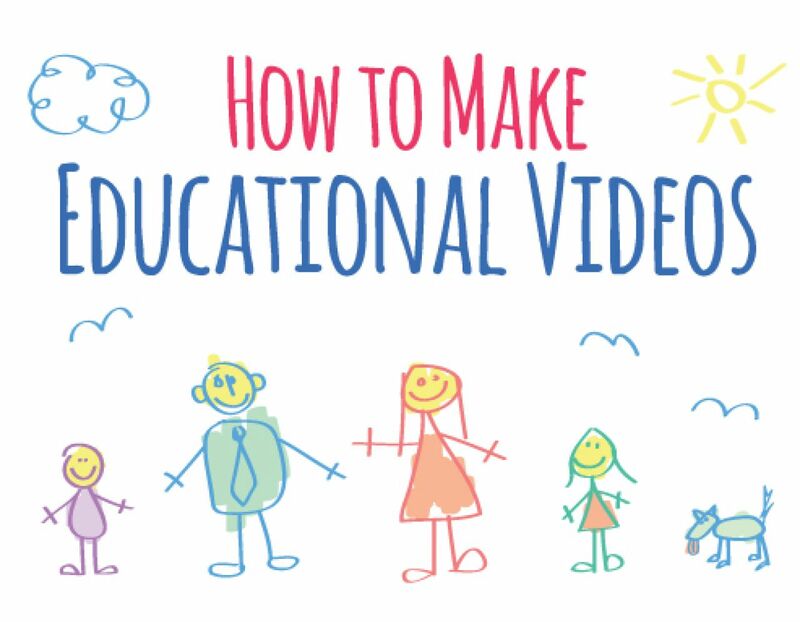 What makes a good educational video? Effective educational videos are driven by emotion and backed by facts. Without emotion they’re bland and boring. Without enough factual backing they’re ineffective. As a video creator, you need to strike a balance between keeping eyes on the screen and brains on the content you’re sharing. Sticks to a single point and drives it home using real-world examples that show it in various contexts. Draws on examples that tap into the personal experience of the people watching. If you’re making an educational video for toddlers, don’t use examples that would only appeal to teenagers. Doesn’t throw in the kitchen sink. You need to provide enough context to make your point without drowning the viewer in irrelevant information. Shares further resources, either at the end of the video, in the description or in a supporting blog post. This lets you share sources and links interested viewers can follow up on, while keeping the video on point! Keeps it conversational to keep those engagement levels up. Has a powerful call to action that helps the learner put it all into practice. There is one other key factor you need to consider if you want to create really effective videos. You need to tailor the content to the audience you’re trying to reach. Imagine you need to make two videos about the water cycle. One needs to be an educational video for preschool children and the other for a corporate training weekend. These two groups have very different levels of experience, expectations and understanding. What appeals to one will fall flat with the other. The examples you use, the stories you tell and the graphics you show will be completely different. Keep the person you’re creating for firmly in mind when you’re designing an educational video. Draw up a quick personality profile and refer to it when you’re outlining the content. What are their likes, dislikes and interests? What experiences do they have that I can draw on? What are their goals? How does watching this video help them achieve those goals? What are their values? Can I incorporate them in the video and build a stronger relationship? You can also draw on the questions used by content marketers to create customer avatars to help you understand your audience a bit better. Using Biteable as an educational video maker it’s a piece of cake to create great educational videos quickly and easily. You can use some of Biteable’s educational video templates to create a lot of different styles of video! You’re fighting for the attention of young children against Disney, Pixar and interactive iPad games. You’ve got your work cut out for you! When creating educational videos, don’t be afraid to ask your audience a few questions and do some research. Check out some of the popular TV shows for the age group you’re creating for. What works? What are the visuals like? What kind of music do they use in the background? Use this as inspiration. Our Claymation template can help you craft great learning videos for toddlers. Most kids are familiar with this style of animation, so combine this with upbeat music and very simple text and you can craft a short, sweet learning video! If you’re making educational videos for slightly older kids, you can add a bit more information. The Science Kids Rock YouTube channel used a micro-presentation to wrap up a module and emphasize the key learning points. Consider creating short videos at the end of bigger topics that highlight and re-emphasize key learning points. If your classroom allows for it, you can even include a call to action like “Share your favorite part of the lesson with your friends.” Teaching others can improve retention rates up to 90%! Quality corporate training helps us learn new skills and improve at work. But for years, despite relatively large training budgets, we’ve struggled to make the most of this opportunity. Many companies have stuck to old methodology, using long sessions to pass on key learning points. Incorporating short videos to summarize key learning points can really help break sessions down and keep people engaged! The micro-presentation template is great for presenting new ideas or summarizing longer seminars. You can use it to tell the story of a product or movement or to present a whole new concept. Teachers who use video in their classrooms have more engaged students than teachers who don’t. Depending on the subject and your budget, you can do some amazing things with video. You can create fun infographics on various subjects from the most interesting, real-life uses of trigonometry to fascinating facts about human anatomy. Infographics are a great way to add a bit of life and fun to difficult and sometimes dry subjects, and to ignite interest by sharing relevant, real-life examples with students. Every kid who’s ever spent an afternoon solving algebra problems has wondered about their real world applications. If the popularity of Horrible Histories and the Sci Show has taught us anything, it’s that sharing real stories in a fun way is a lot more effective than repeating the same historical date over and over again. Don’t take video creation too seriously. Inject a little humor and don’t be afraid to show off a little personality. Edutainment videos increase both short and long term retention, so have fun with them! Leave boring behind and start creating educational videos that make viewers excited about learning new things!